You are here: Home / Language / Fall Fun! 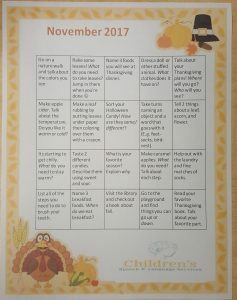 We have another calendar of activities to try at home with your child. Make sure to take a photo (or photos) of the activities that your family participates in and bring it to hang up on the CSLS bulletin board in the waiting room! Leaf crayon rubbings are a fun and easy craft for Fall! Begin by collecting leaves from outside (or bring your materials with you and do this on a nature walk!). Try to get a variety of shapes and sizes. Put a leaf under the paper. You can tape it to the back of the paper to help keep it in place. 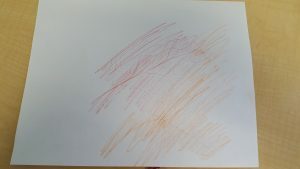 Rub the edge of your crayon over the leaf to make your picture. Try using a variety of leaf shapes and sizes, or keeping the same leaf but changing your crayon color. Receptive Language: You can give directions such as find a brown/orange/yellow leaf and find two small leaves. You can use a variety of concepts here: color (e.g. brown leaf), texture (crunchy), and shape (round, pointed). Expressive Language: Now it is your child’s turn to tell you what to find! You can prompt your child wi th a question: What leaf should I find? or Tell me what color to look for! If your child needs help with this, you can model two options: Should I find an orange leaf or the brown leaf? Location: Put the leaf under the paper. 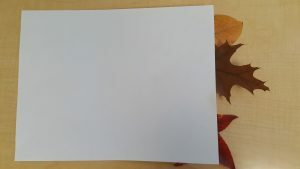 Put the paper on top of the leaf. Questions: Where did the leaves come from? What colors do you see? How many leaves did we find? Motor Speech: Speak with your PROMPT© trained clinician to determine which of the words below are appropriate for your child’s lexicon. Put it on top, you do, you do it, I need it, see it.